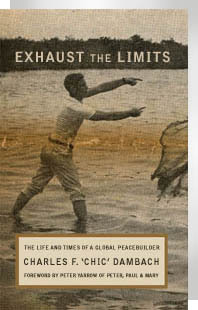 Chic Dambach will discuss his new memoir, Exhaust the Limits: The Life and Times of a Global Peacemaker, which recounts his remarkable life story. Inspired by the leaders, causes and music of the 1960’s, Chic set out to dedicate his life to peace-building. He later became President of the National Peace Corps Association, Operation Respect and several other national organizations. As a mediator, he helped end two brutally violent wars in Africa. Along the way, Chic witnessed the torture of a black football teammate, led a strike for his Peace Corps training group, grieved for the murder of his best friend and mentor, donated a kidney to save his son’s life, faced financial ruin, and created the first Global Symposium of Peaceful Nations. Exhaust the Limits is a compelling story of Chic’s life-long dedication to the work of peace-making, and an inspiring read for activists young and old. For more information on the book, visit www.exhaustthelimits.org. Sandwiches, drinks and dessert will be served. Charles F. “Chic” Dambach became President and CEO of the Alliance for Peacebuilding in 2005, following many years of experience in conflict resolution and peacemaking. Previously, Chic headed the National Peace Corps Association, Operation Respect and the National Assembly of Local Arts Agencies (now, Americans for the Arts). In 1998 Chic helped form and lead a team of returned Peace Corps Volunteers to work informally with the leaders of Eritrea and Ethiopia to help end their border war. The team also facilitated joint meetings among the leaders of the combatants in the Congolese civil war and participated in the Inter-Congolese Dialogue, which led to the formation of an interim coalition government and an official election. Chic is a writer, lecturer and consultant on nonprofit governance. He is on the advisory boards for the United Nations Association of the National Capital Area, the People’s Peace Fund and the Coalition for the Prevention of Bullying. He holds a BA degree from Oklahoma State University and an MBA from Wake Forest University.